(Bloomberg) -- Oil slipped as an unexpectedly big jump in U.S. crude supplies unnerved a market already anxious about global demand. Futures turned negative after the storage report on Wednesday, losing 0.9 percent in New York trading. The U.S. Energy Information Administration said crude stockpiles grew by 2.8 million barrels last week. The increase, which topped industry and analyst estimates, was blamed in part on a closure of the Houston Ship Channel that’s disrupted American exports. “It’s a little bigger build than everybody thought we’d get," said Rob Thummel, managing director at Tortoise, a Kansas-based money manager. The shipping delays, while “transitory,” are likely to ripple through oil markets for the next couple of weeks, he said. Crude joined a sell-off for equities and a rally in U.S. Treasury bonds as economic jitters sped a flight to perceived safety. European Central Bank President Mario Draghi on Wednesday said an accommodative policy stance is still needed, given slow growth in the region. The U.S. dollar also rallied, sapping the appeal of greenback-denominated commodities like oil. Crude has failed to summit the $60 a barrel mark repeatedly over the past week. 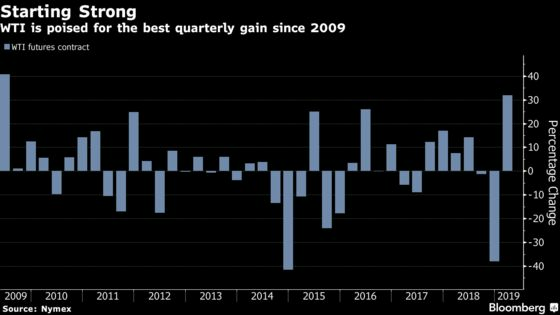 Still, it’s poised for the best quarterly gain since 2009 as the Organization of the Petroleum Exporting Countries and its allies curb production to clear excess inventories. Power outages in Venezuela and American sanctions on Iran have also supported prices, even as uncertainty over U.S.-China trade talks give investors pause. West Texas Intermediate for May delivery fell 53 cents to $59.41 a barrel at the close of trading on the New York Mercantile Exchange. It’s risen about 30 percent so far this quarter. Brent for May settlement declined 14 cents to $67.83 a barrel on the London-based ICE Futures Europe exchange. The stockpile increase in the U.S. overshadowed a decline for gasoline inventories. Inbound and outbound shipments of crude both fell and while refined product exports didn’t show an impact from the Houston Ship Channel disruptions, that may follow next week, Thummel said. Parts of the channel have been closed since a fire at a chemical-storage facility last week. Port officials said Wednesday that normal traffic may not be restored until this weekend. Gasoline futures slid 3.1 percent to $1.8955 a gallon. Oil is gushing out of Nigeria at the fastest pace since at least mid-2016 with crude shipments surging to 2.02 million barrels a day so far in March.